Send a lavish display of colour with Gerberas aplenty. 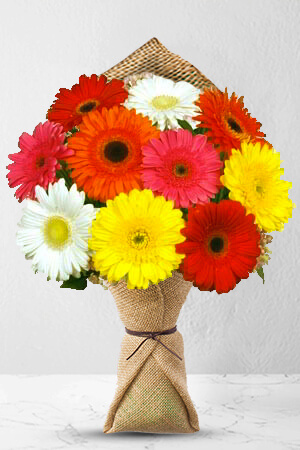 This lovely bountiful bunch of flowers is right for every occasion, and is guaranteed to give happy thoughts and be loved by all. The vase in the picture is not included, however if you would like to make your flower gift extra special, why not add a vase to your order? We recommend a Premium Vase to leave a lasting impression. The flowers were delivered on time. Easy to book. Arrived as scheduled. Really simple to follow and you know that it will arrive when you have asked. I wasn't sure about sending to NZ but it arrived at a good time and it brightened the day for a friend who had just lost her husband. Good product (flowers). Ordinary pricing system. Two exact same orders at the same time , >13% (>$9) price difference.